On 22-24 June 1909 over 400 scientists and dignitaries from 167 different countries gathered at Cambridge to celebrate the centenary of Darwin's birth and the fiftieth anniversary of the publication of On the Origin of Species. The event was an unprecedented success - never before had such a celebration been held, not for an institution or a nation - but for an individual scientist. The celebrations began with a reception in the Fitzwilliam Museum. On 23 June presentations and speeches in the Senate House were followed by a garden party given by the Master and Fellows of Christ's College in the College grounds. In the evening a banquet was held in the New Examination Hall of the University, the Museums Site. During the banquet Darwin’s eldest son William (1839-1914) gave one of the speeches. He remarked: “I am sure my father would have said, though, perhaps, with a tone of apology in his voice, that if there was to be a [Darwin] celebration there could be no more fitting place than Cambridge. 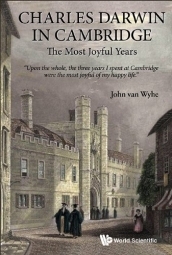 He always retained a love for Cambridge and a happy memory of his life here. It was the happiest and gayest period of his life”. (Darwin and Darwin eds. 1909, p. 15) The banquet was followed with a reception by the Master and Fellows of nearby Pembroke College. On the 24th honorary degrees were conferred in the Senate House, and Sir Archibald Geikie, President of the Royal Society, gave his Reed lecture ‘Darwin as geologist’. In the afternoon there was a garden party given by Darwin’s children at Trinity College. Darwin’s rooms at Christ’s were open to visitors during the afternoon of the 23rd and the morning and afternoon of the 24th. 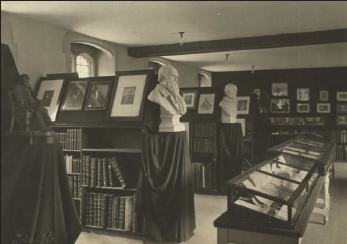 An historic exhibition of Darwiniana was held in the downstairs room of the Old Library at Christ’s. It included portraits, busts, notebooks, manuscripts, letters and objects used on the Beagle voyage. Most were lent by Darwin’s children. The printed exhibition catalogue listed 257 items. (Shipley and Simpson 1909) Many distinguished visitors from around the world came to see the exhibition and signed their names in a book now kept in the Old Library at Christ's. An American delegation presented the College with a large bronze bust of Darwin made by the sculptor William Couper for the New York Academy of Sciences in the same year. The first bust was given to the American Museum of Natural History who commissioned a copy from Couper to send to Cambridge. The bust now stands in the newly refurbished portico in the College grounds. Darwin’s library, then kept at the Botany School, Downing Street in Cambridge, could also be viewed by visitors in 1909. The Sedgwick Museum displayed rock specimens collected by Darwin during the voyage of the Beagle, and the University Library offered an exhibition of manuscripts and books illustrating the progress of science. Shipley created a magnificent album containing many of the press cuttings, invitations, menus, speeches and other memorabilia of the 1909 celebrations. There were other events around the world. For more detail see Richmond, Marsha. 'The 1909 Darwin Celebration: Reexamining Evolution in the Light of Mendel, Mutation, and Meiosis' Isis, 2006, 97: 447-484. It was indeed interesting at the time to reflect, while looking upon this richly arrayed throng, that the past energies of one great life had occasioned these general rejoicings, symbolising as they did the honour to the personality of the great naturalist himself and the expectation of greater things to come by the continuance of his labours. Below are related 1909 publications available on Darwin Online.